Purpose: The aim of this investigation through post-hoc analyses was to determine the ability to achieve gingival health in the short term with daily rinsing with an essential oil containing antimicrobial mouthrinse. 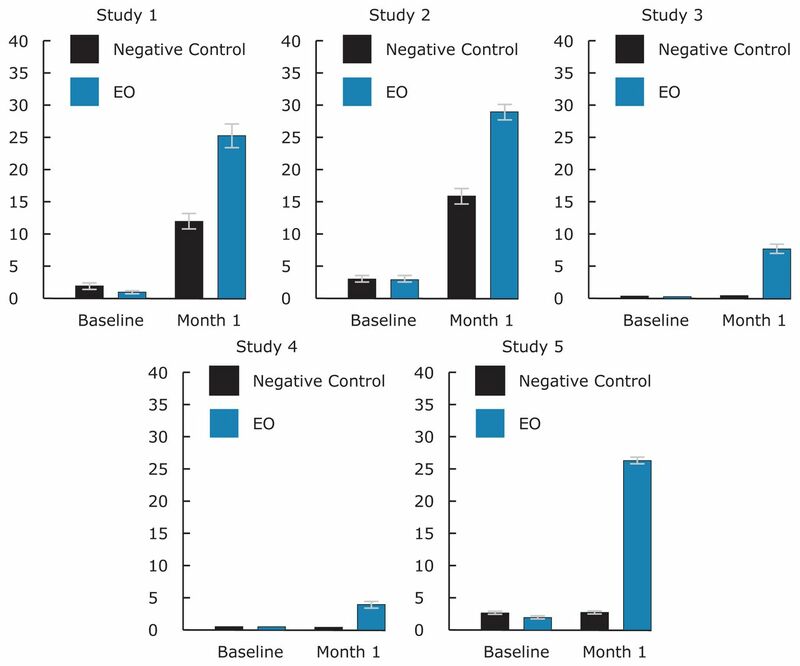 Methods: Conventional Analysis of Covariance (ANCOVA) on whole mouth mean plaque and gingivitis scores were originally conducted to demonstrate efficacy of adjunctive use of Cool Mint® LISTERINE® Antiseptic (EO) compared to negative control [brushing (B) or brushing/flossing (BF)] in each of 5 studies containing a 4 week evaluation. The Modified Gingival Index (MGI) was split into 2 categories: healthy (scores 0, 1) and unhealthy (≥2). Data, reflecting subjects that completed 4 weeks of treatment from 5 studies, were evaluated to determine the mean percent of healthy sites and mean percent of more inflamed “affected” areas (MGI≥3). Results: At baseline, the mean percent healthy gingival sites ranged from 0.1 to 3.2%. At 4 weeks, up to 29.3% and 16.1% of sites were healthy for the EO group and negative control group, respectively. Three and 6 month data from 2 of the 5 studies resulted in up to 39.6% and 62% at 3 and 6 month mean percent healthy sites per subject for EO and up to 17.2% and 15.6% at 3 and 6 months, respectively, for negative control. Virtually plaque free sites (PI =0, 1) at 4 weeks ranged up to 34.3% and 8.1% for EO and control groups, respectively. Conclusion: Significantly more healthy gingival sites and virtually plaque free tooth surfaces can be achieved as early as 4 weeks with use of an essential oil antimicrobial mouthrinse. This finding continues through 6 months twice daily use as part of oral care practices compared to mechanical oral hygiene alone. There is a broad base of evidence for use of antimicrobial mouthrinses, including an essential oil (EO) containing mouthrinse, to provide clinically relevant reductions in supragingival plaque and gingivitis when added to usual oral hygiene. Efficacy has been acknowledged through acceptance by the American Dental Association Council on Scientific Affairs1 and reported in meta-analysis2 or systematic reviews.3,4 This evidence is primarily based on 6-month clinical trials. The aim of this investigation was to evaluate the ability of an EO rinse to achieve healthy gingival tissue after 4 weeks use by conducting post-hoc analyses from 5 clinical trials using Modified Gingival Index (MGI) site data. 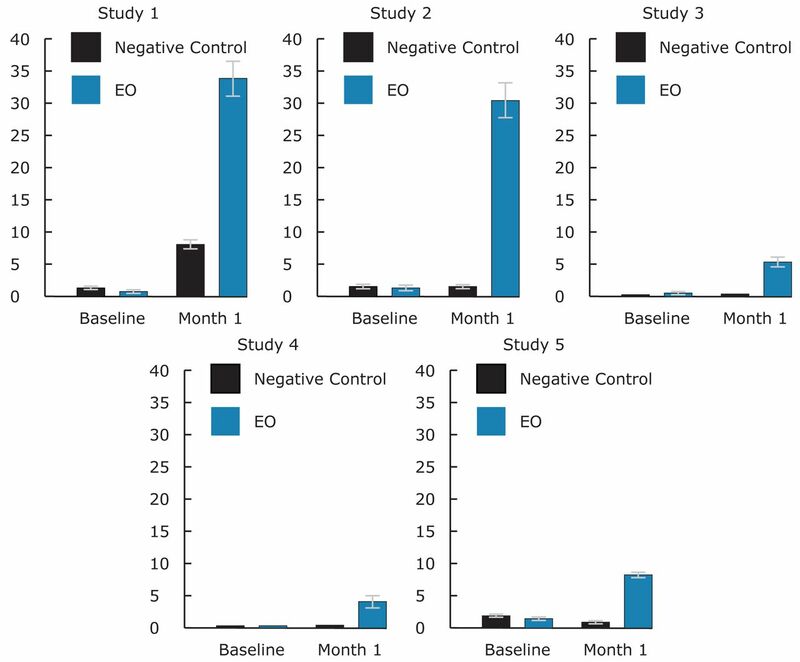 In all 5 clinical trials, a statistically significant difference was demonstrated in favor of the EO rinse over the control using standard analysis of covariance of mean index scores per protocol objectives. Post-hoc analyses were conducted to determine mean percent healthy sites (MGI values 0, 1) and mean percent more inflamed “affected or problem sites” (MGI values≥3) using the MGI site data. The same analyses were also applied to the plaque index to determine percent of virtually plaque free sites (PI values 0, 1) as well as effect on sites with heavier plaque scores (≥3). All clinical studies originally designed to determine efficacy of an EO rinse in subjects with mild-moderate existing plaque and gingivitis having a 4 week evaluation period,7 and having raw data available, were selected for this report, providing a total of 5 studies. All studies were Institutional Review Board approved, single-center, examiner-blind, controlled, randomized trials. In order to assess short term efficacy in achieving healthy gingival tissue post-hoc analyses were conducted on individual gingival sites scored. It is important to note that in addition to the 4 week primary timepoint of interest for this investigation, 1 study had a 2 week evaluation and 2 studies had 3 and 6 month evaluations. Also, 1 of the 6 month studies included a flossing group. For the purposes of these post-hoc analyses, the authors selected the treatment groups from each study that incorporated brushing and placebo rinsing (B) or brushing, flossing (BF) (no placebo rinse), as the negative control group and treatment groups incorporating brushing and EO rinsing (BR) or brushing, flossing and EO rinsing (BFR) as the EO group. Each study was performed in accordance with the protocol, International Conference on Harmonisation Good Clinical Practice guidelines (ICH E6)8 and applicable local regulatory requirements and laws. Each trial was statistically powered to meet the individual study objectives. Table I provides further information regarding study group sizes. Subjects providing informed consent and meeting the inclusion criteria presented to the clinical sites for all examination visits having refrained from oral hygiene for at least 12 hours, but no more than 18 hours prior and having refrained from eating, drinking or smoking for at least 4 hours prior to their examination. At the baseline, an oral tissue examination was conducted, MGI on the buccal and lingual marginal gingivae and interdental papillae and Turesky modification of the Quigley Hein Plaque Index (PI) on 6 surfaces per tooth were determined.9-11 If qualified, subjects were randomized to 1 of the study treatment groups, received instructions and were supervised in their first use of the assigned treatment. A baseline supragingival dental prophylaxis was not provided. At all post baseline visits, examinations were completed as at baseline and subjects were assessed for product use compliance. All subjects were instructed to brush their teeth with the provided fluoride toothpaste and adult soft textured toothbrush. Subjects on rinse regimen used either placebo rinse or Cool Mint® LISTERINE® Antiseptic (Johnson & Johnson Healthcare Product Division of McNEIL-PPC, Inc, Skillman New Jersey) full strength twice daily, 20 mL for 30 seconds. In the case of study 4, BF group brushed and used floss once daily and the BFR group brushed, flossed once daily and rinsed with their assigned mouthrinse twice daily. Subjects maintained a diary of their treatment use which was evaluated periodically through each study for compliance along with assessment of used test product. During the course of the trials, subjects followed their usual dietary habits. They were instructed not to use any unassigned oral care products, or have their teeth professionally cleaned, bleached or have any dental work done except for an emergency. Subjects were allowed to use an interdental cleaning device only to remove impacted food between the teeth (studies 1-3, 5). As the subjects signed a consent form they were sequentially issued a subject ID, and upon qualification, assigned a unique randomization number, which determined the treatment assignments during the study. Demographic and baseline characteristics were compared across treatment groups for each study using Analysis of Variance (ANOVA) or a Chi-Square test (as appropriate for the type of data being considered). If the expected number of subjects within a specific category was sufficiently small, Fisher's exact test was used in place of the Chi-Square test. The primary analysis set was intent to treat subjects, defined as all randomized subjects who used at least 1 dose of the study product and had data for mean MGI and PI. Study analyses based on whole mouth mean index scores were performed using the ANCOVA model with treatment as a factor and the corresponding baseline value as a covariate. The comparisons were made at the 0.05 level, 2-sided. Summary statistics were provided by treatment group at each visit. Since each of the studies with a 4 week evaluation resulted in statistically significant differences between the EO rinse and negative control, it was appropriate to conduct further analyses of the study data. Posthoc analyses, based on site data, were conducted to determine the extent that healthy tissues were attainable in this time period. Within subject mean percent of healthy sites were calculated by taking numbers of sites with MGI score of 0 or 1 divided by total number of sites (maximum number of sites 108). Similarly, mean percent of within subject virtually plaque free sites (PI score=0, 1) were calculated by taking numbers of sites with PI scores of 0 or 1 divided by total number of sites (maximum number 168 sites). For the more inflamed or problem gingival sites (MGI≥3 representing moderate-severe inflammation) and the most affected sites or greater areas of plaque accumulation (plaque scores≥3), a similar analysis was conducted. Table I provides a summary of demography and baseline data for the 5 studies. There were no differences between the groups in each study. As seen in the table there were some variations among the 5 studies in baseline levels of MGI, e.g. 2.05 (study 2) to 2.49 (study 3). Studies 1 and 2 presented lower baseline MGI and PI and study 3 provided a more diseased population. At baseline there was no imbalance between treatment groups in percent healthy sites or virtually plaque free sites (Table II). Table II presents whole mouth mean percent healthy sites (MGI value 0, 1). The 3 and 6 month data is also provided in these tables for studies 4 and 5. There were no statistically significant differences between groups at baseline for percent of healthy sites. The whole mouth mean percent of healthy sites per subject at 4 weeks ranged from 0.8 (study 3) to 16.1 (study 2) for the negative control and 4.2 (study 4) to 29.3 (study 2) for the EO group, with all studies showing a difference in favor of the EO rinse, which was significant, except for study 4 (p=0.052). For the longer time periods of 3 and 6 months, the mean percent of healthy sites per subject increased over time up to 39.4 at 3 months and up to 62.0 at 6 months for EO group and up to 17.2 and 15.6, respectively, for the negative control group. All improvements were statistically significant and in favor of EO. Table III provides the traditional whole mouth adjusted mean MGI and PI scores across the 5 studies and the percent reduction for EO vs. negative control. Four week reductions ranged from 3.5% (study 4) to 15.5% (study 5) for MGI and between 16.9% (study 5) and 21.9% (study 2) for PI. A statistically significant difference (p<0.001) was shown between the EO rinse and the negative control in favor of EO at 4 weeks across all 5 studies. Table IV presents mean percent virtually plaque free sites (PI scores of 0, 1) across the 5 studies, showing no differences at baseline. The 4 week mean percent virtually plaque free sites ranged from 0.4 (study 3) to 8.1 (study 1) in the negative control group and from 4.5 (study 4) to 34.3 (study 1) in the EO rinse group. Statistical significance in favor of the EO rinse was noted at all visits. For studies 4 and 5, at 3 and 6 months, mean percent virtually plaque free sites ranged up to 54.9% and up to 68.8% in the EO group with the negative control group up to 29.6%. Table V presents the 4 week percent “most affected or problem sites” (MGI≥3 and PI≥3). For the EO rinse group, the range in mean percent MGI problem sites was 3.1 (study 1) to 20.4 (study 3) and for the negative control group, 3.7 (study 1) to 45.7 (study 3). For the whole mouth mean percent heavier plaque accumulation sites per subject, the range was 6.2 (study 2) to 50.9 (study 3) for the EO group and for the negative control group, 29.4 (study 2) to 81.1% (study 3). All differences were statistically significant (p<0.001) in favor of EO with the exception of study 1 (p=0.833 for MGI≥3). Figure 1 provides baseline and 4 week mean percent healthy sites. There were 3.2 or less mean percent healthy sites at baseline across the studies, at 4 weeks up to 29.3 mean percent healthy sites in the EO group, and up to 16.1 in the negative control group. Figure 2 presents the mean percent of healthy sites per subject over 6 months for studies 4 and 5. EO improvements increase over the 6 months and the EO group is statistically significantly better than mechanical oral hygiene alone at all post baseline visits. Figure 3 provides baseline and 4 week mean percent virtually plaque free sites (PI scores of 0, 1). There were 1.8 or less mean percent virtually plaque free sites at baseline across the studies, at 4 weeks up to 34.3 mean percent virtually plaque free sites in the EO group, and up to 8.1 in the negative control group. The primary interest for this report was achievement of healthy gingival tissue in the short term; however, since plaque is the primary etiologic agent for gingivitis, the plaque data from the same studies was also examined. This is the first time short term gingivitis and plaque data have been presented as mean percent of sites (areas scored from the MGI). Since gingival health is one of the main goals of oral hygiene care, healthy gingival sites are presented in addition to traditional reductions in the level of gingival inflammation. Similarly, the plaque site data was examined to determine the number of virtually plaque free tooth surfaces. The use of an EO containing antimicrobial rinse provided a statistically significant reduction in mean plaque scores compared to negative control across all 5 studies. The plaque reductions were quite significant in the short term. In the longer term studies presented, a statistically significant difference was also noted at 3 and 6 months in favor of the EO rinse, providing statistically significant and clinically relevant reductions of up to 42% at 6 months. Overall gingivitis reductions across the 5 studies (Table II) of up to 15.5% may not be considered clinically relevant in the short term compared to control, however, up to 29.3% mean percent healthy gingival sites could be considered clinically relevant. There is a consistent statistically significant difference in favor of using an EO antimicrobial rinse. This is particularly evident with the more diseased baseline gingivitis condition as shown in study 3. Four weeks was the primary time-point of interest, however, to understand how short term relates to longer term, 3 and 6 month data from 2 of the same studies was considered. It is relevant because not all chemical agents sustain their early benefits, a fact that impacts professional decisions with product recommendations.15 Similarly, in clinical practice it is important to know how quickly the prescribed oral hygiene program will provide oral health improvements. EO fits both scenarios because the longer it is used, the greater is the improvement that starts very early, as shown in study 2 which incorporated a 2 week examination. A difference in the mean percent healthy gingival sites was noted as early as 2 weeks (negative control group - 11%, and EO group - 18.7% (p<0.001)). A greater improvement was seen in this same study at 4 weeks (negative control - 16.1%, and EO - 29.3%) in mean percent healthy sites (Table III). On the other hand, in studies 4 and 5 that included 3 and 6 month evaluations, a longer term outlook for improving the health of the gingival tissues was exhibited. 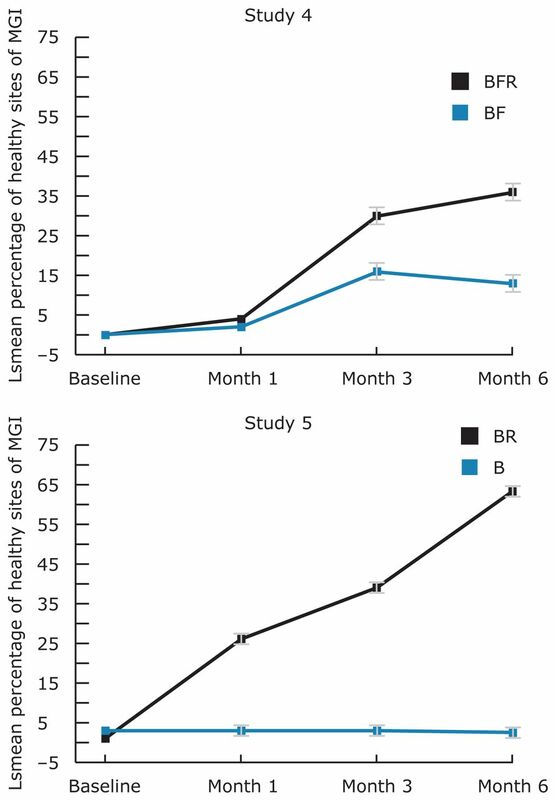 In study 4, post-hoc analysis provided the mean percent healthy sites for negative control as 2.1 for BF group and for BFR (EO) 4.2 at 4 weeks (Table III). At 3 months, the mean percent healthy sites were 17.2 and 29.7 for the BF (negative control) and BFR (EO) groups, and at 6 months 15.6 and 36.9%, respectively. In this study, although the short term results may not be clinically relevant, they are nevertheless heading in a healthier direction and provide an early indication that better gingival health can be expected as daily rinsing is practiced consistently over 6 months. In study 5, a similar trend was found with a greater magnitude of improvement. The long term results provide greater and clinically relevant results (Figure 2). The magnitude of gingival health improvement in the short term may be related to the baseline condition, Hawthorne effect or treatment efficacy, as well as the individual study designs and objectives. For example, in studies 1 and 2 where the baseline level of disease is lower, the magnitude of change at 4 weeks was higher than for studies 3 to 5 where the baseline gingivitis level was higher. Also of interest was determining what happened to the more diseased or problem sites (MGI score≥3), which really stand out when evaluating the gingival tissues. A similar analysis was applied to plaque scores ≥3. For these more affected sites, a beneficial effect was seen as early as 2 weeks (mean 8.5% for negative control, and 4.9% for EO (p=0.028) and in the same study at 4 weeks, 7.1% and 3.1%, respectively). Continued improvement with time up to 6 months was shown in the longer term studies with up to 6.8% and 2.5% of sites having MGI scores ≥3. This finding follows a reduction in the areas most affected by plaque (PI≥3). The mean percent problem plaque scores was 33.5% for negative control and 13% for EO at 2 weeks (p<0.001) and 29.4% and 6.2% for EO at 4 weeks (Table V). For the longer term studies, up to 10.5% of sites had PI scores ≥3. While both the negative control and the EO groups continued to reduce the heavier plaque scores from 2 to 4 weeks, the magnitude of change was higher in the EO group. The population of study 3 had a higher severity of gingivitis at baseline that apparently interfered in tissue response in comparison to studies 1 and 2, although they are 4 week studies by design. What is interesting is that while the rinsing regimen was not as successful at bringing those patients with higher incidence of “most affected areas” to health (scores 0, 1) in the short term, rinsing was very successful at downgrading those affected areas to mild gingivitis, preventing the gingivitis from reaching a more severe pattern. This supports use of EO as an auxiliary tool when treating gingivitis. Studies 4 and 5 are 6 month studies with more inflammation, and therefore, the response of these studies needed to be viewed separately from studies 1 to 3. Seeing more immediate or shorter term results may help to motivate patients to adopt an oral care recommendation, especially those patients with higher numbers of more inflamed or most affected sites. It is also important to provide patients with reasons to continue to comply with oral care instructions and recommendations beyond the short term. Examining the data by presenting results as improvements in gingival health by determining the percentage of healthy sites or virtually plaque free tooth sites - the goal of home care – provides an impactful way of translating the clinical research into a more clinically relevant or visual manner to aid in educating and motivating patients about the benefits of rinsing with EO. Significantly more healthy gingival sites and virtually plaque free tooth surfaces can be achieved as early as 4 weeks with an EO mouthrinse. This finding continues through 6 months with twice daily rinsing as part of oral care practices compared to mechanical oral hygiene alone. Use of an essential oil antimicrobial rinse can reduce the number of more inflamed gingival sites in the mouth in the short term, lessening the severity of gingivitis and supporting the benefits of rinsing as an adjunct to mechanical oral hygiene. Christine A Charles, RDH, BA, is the Director, Clinical Research, Department of Clinical Operations; Toni Anne Lisante BA is a Manager of Clinical Research; Ratna Revankar PhD is Director, Global Biostatistics. All three are at Johnson & Johnson Consumer & Personal Products Worldwide, Morris Plains, New Jersey. Jose Roberto Cortelli, PhD, is an Associate Professor; Sheila Cavalca Cortelli, DDS, PhD, is an Associate Professor; Davi Aquino, PhD, is an Assistant Professor. All three are at the Nucleus of Periodontal Research, University of Taubaté (UNITAU), São Paulo, Brazil. At the time this research was conducted, Chhaju R. Goyal, BDS, was an Associate Research Dentist at Bio Sci Research Canada Ltd. Mississauga, Ontario, Canada, and Pejmon Amini, DDS, was a clinical examiner at Bio Sci Research America Inc. Las Vegas, Nevada. This study supports the NDHRA priority area, Health Promotion/Disease Prevention: Investigate the effectiveness of oral self-care behaviors that prevent or reduce oral diseases among all age, social and cultural groups. These 5 clinical studies were sponsored by Johnson & Johnson Consumer and Personal Products Worldwide Division of Johnson & Johnson Consumer Companies, Inc. Authors Revankar, Lisante and Charles are employed by Johnson & Johnson Consumer and Personal Products Worldwide Division of Johnson & Johnson Consumer Companies, Inc. Authors JR Cortelli and S Cortelli serve as consultants to Johnson & Johnson do Brasil Industria e Comercio de Produtos para Saude Ltda.
. J Am Dent Assoc. 1988;117(3):515-516.
. A meta-analysis of six-month studies of antiplaque and antigingivitis agents. J Am Dent Assoc. 2006;137(12):1649–1657.
. The long-term effect of a mouthrinse containing essential oils on dental plaque and gingivitis: a systematic review. J Periodontol. 2007;78(7):1218-1228.
. Essential oils compared to chlorhexidine with respect to plaque and parameters of gingival inflammation: a systematic review. J Periodontol. 2011;82(2):174-194.
. Comparative antiplaque and antigingivitis efficacy of three antiseptic mouthrinses: a two week randomized clinical trial. Braz Oral Res. 2009;23(3):319-325.
. Comparative efficacy of two daily use mouthrinses:randomized clinical trial using an experimental gingivitis model. Braz Oral Res. 2011;25(4):338-344.
. Short Term Gingival Health Improvements with Essential Oil Mouthrinse. IADR (#1716). 2013.
. A modified gingival index for use in clinical trials. Clin Prev Dent. 1986;8(1):3-6.
. Reduced plaque formation by the chloromethyl analogue of victamine C. J Periodontol. 1970;41(1):41-43.
. Use of dental floss. Effect on plaque and gingivitis. Clin Prev Dent. 1982;4(1):5-8.
. Hodges-Lehmann estimators. In: Kotz S, Johnson NL, Read CB, ed. Encyclopedia of Statistical Sciences vol. 3, New York, NY. John Wiley & Sons. 1983. 463–465 p.
. In: Nonparametric Statistical Methods: 2nd ed. New York, NY. John Wiley & Sons. 1999.
. Nonparametric confidence intervals for a shift parameter. In: Annals of Mathematical Statistics. 1963. V.34. 1507–1512 p.
. Comparative antiplaque and antigingivitis efficacy of a multipurpose essential oil-containing mouthrinse and a cetylpyridinium chloride-containing mouthrinse: A 6-month randomized clinical trial. Quintessence Int. 2012;43(7):e82-94.
. Adjunctive benefit of an essential oil–containing mouthrinse in reducing plaque and gingivitis in patients who brush and floss regularly: a six-month study. J Am Dent Assoc. 2004;135(4):496-504.
. Increasing antiplaque/antigingivitis efficacy of an essential oil mouthrinse over time: an in vivo study. Gen Dent. 2013;61(1)23-28.
. The effect of cetylpyridinium chloride-containing mouth rinses as adjuncts to toothbrushing on plaque and parameters of gingival inflammation: a systematic review. Int J Dent Hyg. 2008;6(4):290-303.
. Cetylpyridinium chloride-containing mouth rinses and plaque control. Evid Based Dent. 2009;10(2):44.
. The effect of hexetidine mouthwash on the prevention of plaque and gingival inflammation: a systematic review. Int J Dent Hyg. 2011;9(3):182-90.
. Antiseptic mouth rinses: an update on comparative effectiveness, risks and recommendations. J Dent Hyg. 2013;87(1):10-18.
. Mouthwash use and the prevention of plaque, gingivitis and caries. Oral Dis. 2014;20(1):1-68.